When you’re looking for the perfect learning and development consultant for your team, it makes sense to work with someone who knows the job inside and out. For most of my adult life, I had difficulty breathing through my nose. This dramatically affected my health and state of mind—I couldn’t sleep well, I suffered from severe allergies, and I had to breathe through my mouth all the time. (Take a moment, breathe in, and give thanks.) And as you can imagine, the accompanying heavy snoring and sleep apnea did not win me any fans. Finally, overcoming my own inertia and fear of medical procedures, I decided to get this part of my life under control and scheduled my first visit with a doctor. I asked family and friends for recommendations, and coincidentally my brother had surgery a couple of years ago and strongly recommended that I see his otolaryngologist, Dr. Campos, a specialist in disorders of the ear, nose, and throat (ENT). On my first visit, Dr. Campos asked me a few questions, checked a few things using her ENT gadgets, and then diagnosed me. The ideal solution for me was to have surgery, which consisted in not one, not two, but three different procedures. Though nervous, I could tell she was an experienced professional (she had probably done this hundreds of times), and she was confident yet warm and empathetic. I knew I was in good hands. A couple of months after my initial consultation, I had surgery. After two weeks of a less than fun recovery, I am happy to say I can breathe like a normal human being. My quality of life has improved significantly! Now, imagine for a moment that instead of going to an ENT, I went to a cardiologist or a neurologist. Sound scary? With a different kind of specialist, I might have been misdiagnosed and sent down the wrong path, spending time and money, worrying, and not finding a cure. A lot of frightening scenarios—and a far greater chance that things wouldn’t go as well as they did. This leads me to the business world, and what I do here at SweetRush. I often talk to clients who are interested in filling a temporary role for a learning and development consultant on their team. Many of them are already working with other companies to fulfill those needs, and often I discover they’re working with an IT staffing firm or a general recruitment agency. I am always shocked that they are seeking mission-critical talent from folks who do not specialize in learning and development. That would be as if I had gone to the neurologist to treat my breathing conditions! A couple of years ago, one of our clients, a Big Three consulting firm, came to us with a very specific need. The firm was looking for a senior instructional designer with a focus on eLearning, a business background, and excellent project management skills—a top-caliber learning and development consultant. Even for a specialist, filling this profile is a challenge. But for the IT recruiter, this would be an exercise in futility and waste a lot of client time. 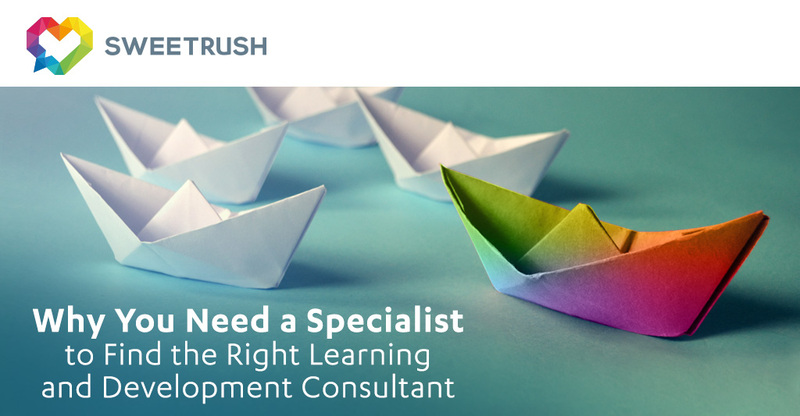 At SweetRush, we understand that instructional designers and other learning and development consultants come in all different flavors, and we can recognize those flavors and select the right one for our clients. In less than a week we could find and submit seven candidates who were well matched to the requirements. The client selected five candidates to interview and finally chose one to join its team. This person ended up engaging with our client for almost two years, which speaks to how well this learning and development consultant fit in and performed with the firm’s team. If you’ve been using an IT recruiting firm to find temporary talent for your learning and development team, I think you’d be far better served with a learning and development–focused firm like SweetRush. With SweetRush, you can expect faster candidate submissions, a higher-quality bar for talent, and unsurpassed support during the engagement. And the best part is that you’ll be able to sleep better…just as I did after the surgery. Do you have a position open for a learning and development consultant? Find out more about SweetRush’s staffing services, or contact Rodrigo. It would make his day to hear from you! Rodrigo Salazar is the Manager of Talent Solutions at SweetRush.